The origins of pasta have a long history since Roman times; like the Latin culinary philosopher Apicio for example, writer of the I century. A.D. and author of the first cookbook who describes in detail the condiments, hinting that the pasta was widely known and used throughout ancient Italy. With the introduction and invention of the boiling process in medieval Italy, the first perforated pasta was created (Rigatoni, Penne and Bucatini) while the invention of dried pasta is historically attributed to the inhabitants of Muslim Sicily who developed and perfected effective drying methods in open air. 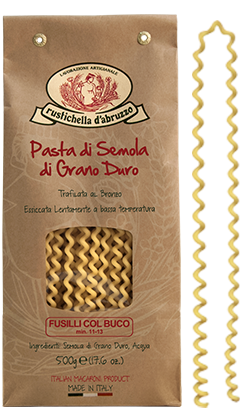 Originally from Campania region, this type of pasta looks like lengthened Fusilli and housewives in the past used to make it by rolling a Bucatino around a knitting needle. 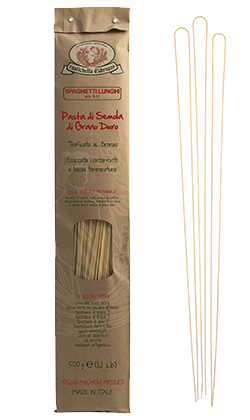 Delicious with a simple Rustichella d’Abruzzo tomato and basil sauce or “alla Pecorara” sauce, combined with Rustichella d’Abruzzo Farindola Pecorino cheese and extra virgin olive oil. Cooking time: 11-13 minutes. This kind of pasta, which has a shorter length than the one of Riccia Lunga, has the peculiar wavy edges that allow it to combine well with most of our condiments, from the red ones to the white ones, and is particularly suitable for the ancient traditional recipes of Abruzzo. The match with Rustichella d’Abruzzo “ai Funghi Porcini” and “alla Norma” sauces is the best. Cooking time: 10-13 minutes. One of the traditional types of pasta from Campania. 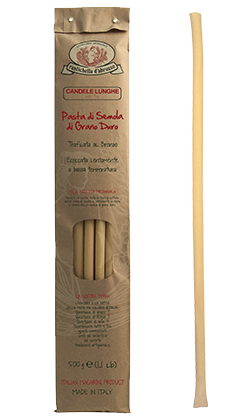 Long, candle-shaped and thicker than 1 cm, this pasta needs to be snapped before being cooked in a pot. The traditional recipe is Candele Lunghe cooked in oven as a classic “red” timballo (meat ragu, mozzarella and Parmigiano Reggiano cheese) or “white” (besciamella sauce, artichokes, cherry tomatoes, olives and bufala mozzarella cheese). It combines well with sauces such as Rustichella d’Abruzzo “alla Pecorara” and “all’Ortolana”. Cooking time: 7-8 minutes. 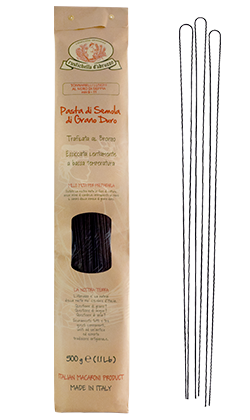 Exclusive Rustichella d’Abruzzo pasta: 50 cm long, bronze-drawn and dried at low temperature, created to satisfy the lovers of seafood. 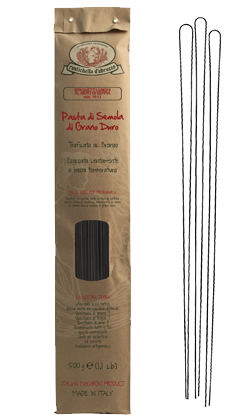 Made with natural squid ink, this type of pasta perfectly combines with scallops, cherry tomatoes, parsley and a bit of Rustichella d’Abruzzo PrimoGrano INTOSSO extra virgin olive oil. Cooking time: 9-11 minutes. 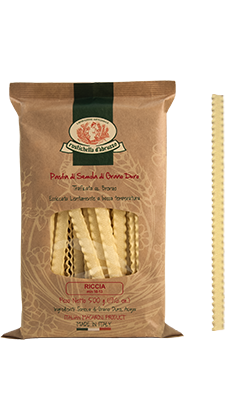 Exclusive Rustichella d’Abruzzo shape: 50 cm long, bronze-drawn and dried at low temperature, it satisfies even the most demanding palates. It is recommended in the classic and everlasting combination with Rustichella d’Abruzzo “Aglio e Olio” condiment, with a bit of Rustichella chili-pepper-aromatized extra virgin olive oil for the lovers of spicy tastes. Cooking time: 9-11 minutes. 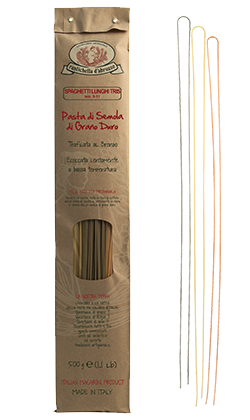 Exclusive Rustichella d’Abruzzo shape: 50 cm long, bronze-drawn and dried at low temperature, made with durum wheat semolina, spinach and tomato, a homage to Italy and its ancient history. In order to find the best way to exalt this kind of pasta, two traditional recipes are highly recommended: Rustichella d’Abruzzo “Pomodoro e Basilico” sauce with a bit of PrimoGrano INTOSSO extra virgin olive oil and Rustichella garlic, oil, mashed mullet’s eggs and anchovies with a bit of our chili-pepper-aromatized extra virgin olive oil for the lovers of intense taste. Cooking time: 9-11 minutes.